PROBABLY no more interesting bit of air action could ever be seen on any front than that involving two triplanes, one a Sopwith, the other, of course, the much discussed Fokker. Both were fast on the controls, almost equally powered and remarkable climbing ships. The most amazing feature about this triplane business is that even today, with all the publicity that has been given to World War planes, few realize that the greatest triplane on the Front was the Sopwith—not the Fokker. The Fokker triplane has drawn an unusual amount of regard mainly because von Richthofen flew it for a considerable period. Voss, the great German sportsman, also won twenty-two victories in three weeks in a triplane. The German triplane has attracted attention also because of the garish designs that have been credited to various noted German Staffels. A German triplane decked out in fantastic colors and diced designs looks more offensive than a Sopwith which had to retain its factory colors. The triplanes used by Ray Collishaw and his Black Gang when they were ordered to keep every German observation plane out of the air over Messines, in 1917, were the only British ships used on the Front during the daytime which were daubed up with unorthodox coloring. Our readers will recall that they were all painted black. The Sopwith triplane was finished and first delivered on May 28th, 1916. 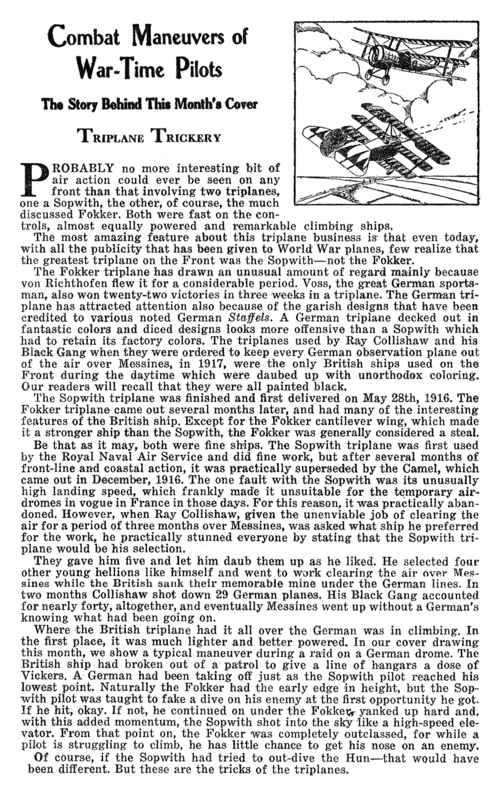 The Fokker triplane came out several months later, and had many of the interesting features of the British ship. Except for the Fokker cantilever wing, which made it a stronger ship than the Sopwith, the Fokker was generally considered a steal. Be that as it may, both were fine ships. The Sopwith triplane was first used by the Royal Naval Air Service and did fine work, but after several months of front-line and coastal action, it was practically superseded by the Camel, which came out in December, 1916. The one fault with the Sopwith was its unusually high landing speed, which frankly made it unsuitable for the temporary airdromes in vogue in France in those days. For this reason, it was practically abandoned. However, when Ray Collishaw, given the unenviable job of clearing the air for a period of three months over Messines, was asked what ship he preferred for the work, he practically stunned everyone by stating that the Sopwith triplane would be his selection. They gave him five and let him daub them up as he liked. He selected four other young hellions like himself and went to work clearing the air over Messines while the British sunk their memorable mine under the German lines. In two months Collishaw shot down 29 German planes. His Black Gang accounted for nearly forty, altogether, and eventually Messines went up without a German’s knowing what had been going on. Where the British triplane had it all over the German was in climbing. In the first place, it was much lighter and better powered. In our cover drawing this month, we show a typical maneuver during a raid on a German drome. The British ship had broken out of a patrol to give a line of hangars a dose of Vickers. A German had been taking off just as the Sopwith pilot reached his lowest point. Naturally the Fokker had the early edge in height, but the Sopwith pilot was taught to fake a dive on his enemy at the first opportunity he got. If he hit, okay. 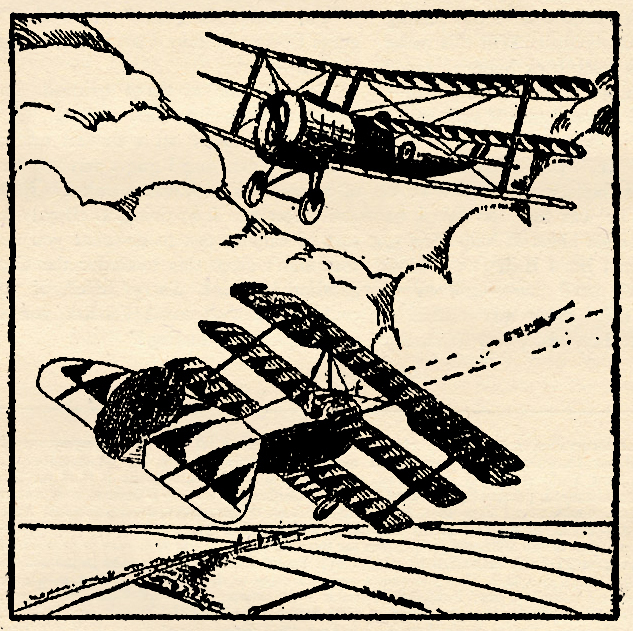 If not, he continued on under the Fokker yanked up hard and, with this added momentum, the Sopwith shot into the sky like a high-speed elevator. From that point on, the Fokker was completely outclassed, for while a pilot is struggling to climb, he has little chance to get his nose on an enemy. Of course, if the Sopwith had tried to out-dive the Hun—that would have been different. 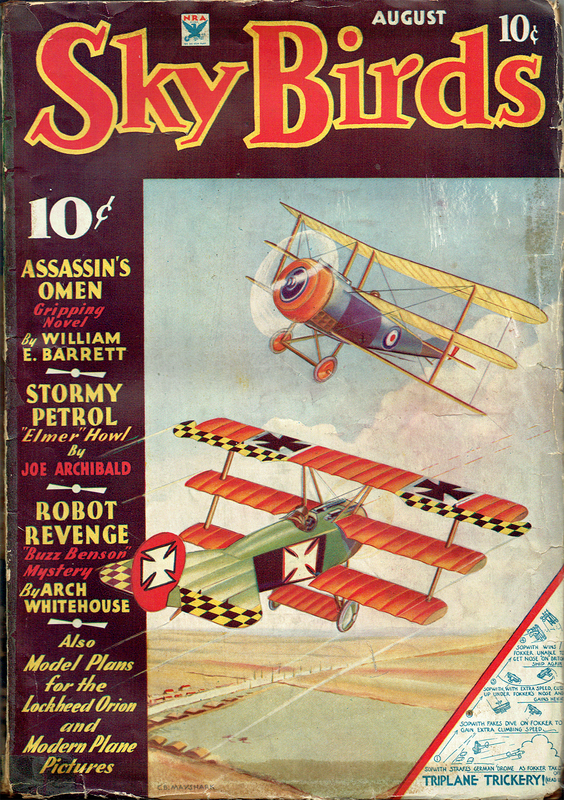 But these are the tricks of the triplanes.